As of December 22 (server save), you will be able to travel to the frozen realm of the percht queen - a secret island inhabited by schiachs and perchts. Use the thick, sticky snow on the island to build gorgeous snowmen but be careful or your creations will stab you in the back. Enter the snowball war against your friends and enemies and turn them into running snowmen. Gather different ingredients which will allow you to face the percht queen on her frozen throne. Defeating the frozen crone grants you access to a new outfit and a taming item for a new mount. The boss, who has a cooldown of 20 hours, can by fought by up to 5 players at the same time. Starting on December 31 (server save), exclusive schiach or pertch items can be found in the boss' loot depending on whether more schiachs or perchts have found salvation through your weapons up until then. Two different versions of the perchts and schiachs can be fought. The easier ones' difficulty ranges between wereboars and midnight asuri while the difficulty of the stronger ones ranges between armadiles and guzzlemaws. In addition to that, we will implement new utilities and effects to properly celebrate new year's eve. 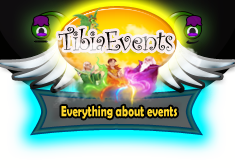 From January 07 till January 10, Tibia's birthday will be celebrated. During this time you can visit Nostalgia Island again where you can hunt monsters with the old monster sprites, dig for treasures or knock down cans. The pinata dragons will also be spawning everywhere. On server save of January 10, all events including the frozen island of the percht queen will disappear from the map again. Afterwards, a week of increased respawn rates and increased mana & health regeneration will start.